Today was a very busy day! 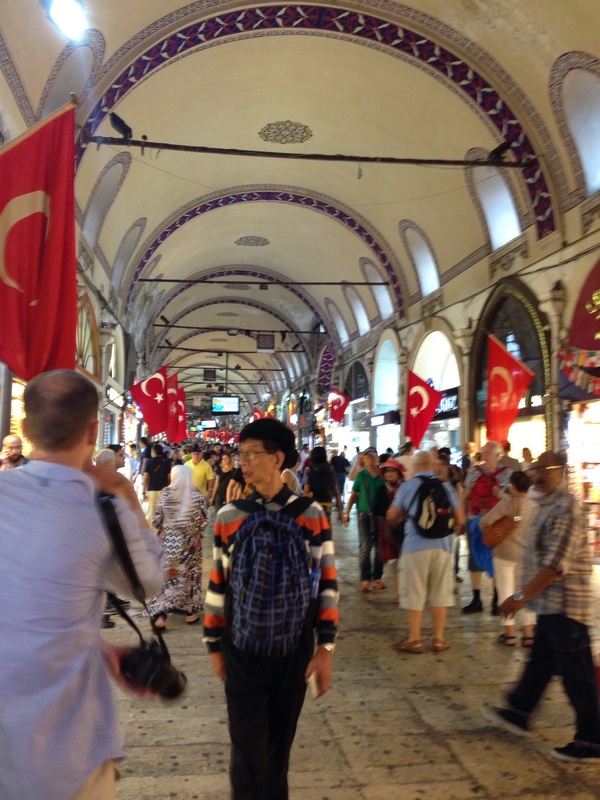 We were out the door with our guide, Jasmine, by 9:30 and headed toward our first stop of a whirlwind day in Istanbul. First, we visited the Hippodrome where chariot races were held, as well as political meetings, executions, and social gatherings. 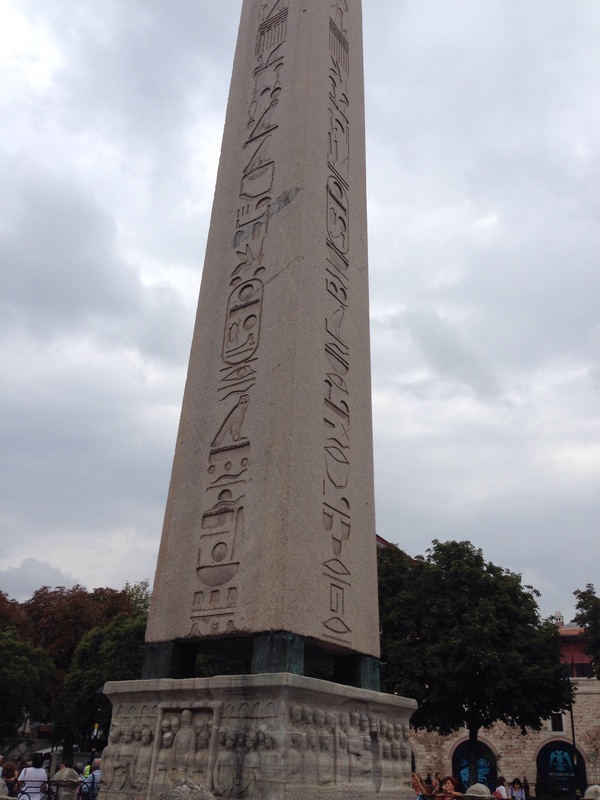 Two of the most notable sights at the Hippodrome are the Egyptian obelisk, which is 3500 years old. It was brought from Egypt by Constantine when he formed Constantinople, but the obelisk was so heavy that they could not convey it further than the sea shore, so it sat there until 300ish AD when they finally figured out a way to move it to the site of the Hippodrome. It took them between 26 and 32 days to move it to the location, and they did it by a pulley system. We know all this because a marble base was created that has depictions of the whole process and inscriptions that tell how long it took. The other notable sight is a bronze column that Constantine had brought from Delphi in Greece. This column was originally crafted by the Greeks using the weapons of the Persians who they had defeated in battle. The weapons were melted down and formed into three snakes. The top part of the column has been lost, but the bottom still remains. Next, it was off to the Blue Mosque (Sultanahmet Mosque), which was built in 1617. The mosque is called this because of the iznik tiles inside the mosque–20,000 in total. The line into the mosque was fairly long, but it moved pretty quickly considering that they were checking to ensure that each person had the proper attire (no bare legs above the knee, no uncovered heads on women, no shoes). Once inside, Jasmine gave us a quick overview of the interior, so we were in and out pretty quickly. Amazing tiles inside the mosque that give the mosque its name. Right across from the Blue Mosque is Haggia Sophia (Divine Wisdom in Greek), which was originally built as a Christian church in the 530s, was converted to a mosque in the 1400s, and is now a museum. Our guide told us that there are many people who are still upset that it is not being used as a church or a mosque. She said that only last week people were protesting that it was not still being used as a mosque. Whatever it’s use, it is a beautiful structure. When it was built, it was a real marvel. This building was the first known building to have a dome on a rectangular structure. It was also the largest church dome (though now it is only the fourth largest). It was a real feat. Many people felt that it was impossible that humans could have built this structure, and they were sure that God delivered it to the people, and that angels were holding it up. When Muslims conquered the city, the church was immediately converted into a mosque. The commander even went so far as to put up a wooden minaret in the first hours that the city was taken because it would make it a holy place. Once a place was deemed a mosque, soldiers were not allowed to sack it. In this way, the commander actually protected the church from damage. The other amazing way that the church was protected in its conversion was that most of the original details of the church were not destroyed or taken out. They were just covered up, so when restoration began, many of the original details could be uncovered by removing whitewash or special wooden windows that had been created. It was really amazing that so much survived considering all that could have happened. The building was pretty incredible. When the church became a mosque, they had to remove all crosses in addition to human forms. You can still see where the horizontal part of the cross on the door used to be. These angels appear in the four corners of the church, but until five years ago, all their faces were covered with painted wings (part of the efforts to eliminate human forms when it became a mosque). They stripped away the paint to reveal this angel’s face; the others are still covered. One of the beautiful mosaics that survived. Mary and John the Baptist plead on behalf of humanity on Judgment Day. We had a delicious lunch and enjoyed talking with our guide about Turkey and Turkish customs. She was very open in her opinions about the current Turkish president and government (not so favorable), the plight of the refugees coming into the country, and the financial well-being of the country. We really appreciated how candid she was about everything. We definitely got a better insight into the real situation in Turkey. After lunch, we went to the Topkapi Palace, which was built in 1478 for the sultan and his family. 36 sultans ruled and raised families in this palace before an Ottoman sultan decided to build a new, more European-esque palace in the 1800s. Most of the Topkapi Palace is viewed and enjoyed from large outdoor courtyards, so when the sky opened up and torrents of rain began to fall, there was little cover. Fortunately, our guide had prompted us to bring umbrellas. Unfortunately, they were very little help. By the time we left Topkapi, my pants were soaked from mid-calf down, and my shoes and socks were soppy. I can’t think of the last time I was out in rain like that. It was just buckets and buckets. The longer it rained, the colder it got so that it felt pretty miserable. There aren’t many pictures from the stop because of all the rain. Rainy day on the Bosphorous! However, despite the rain, we pressed on and made our way to the Grand Bazaar. 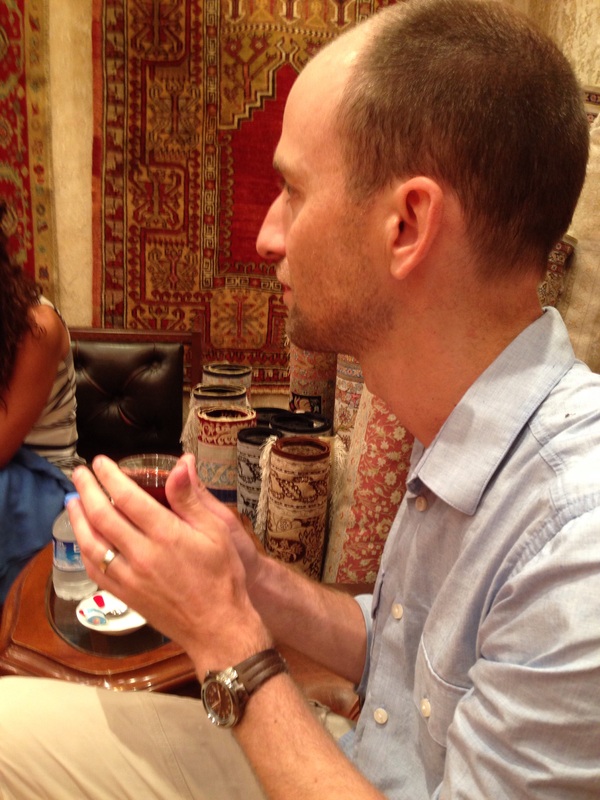 Before we stopped there, our guide took us to a traditional Turkish rug shop. Tim had his heart set on a rug, and they pulled out all the stops when we arrived. They pulled out at least 15 different rugs to demonstrate the different types of rugs and weaves that could be purchased and offered everyone Turkish tea before they even asked what we might be looking for. Alas, what we really wanted was not something they had. Turns out our hall, like many other things in our house, is not standard. It’s too long for the rugs they had available. 🙂 Anyway, it was really neat to have the experience of looking at rugs in Turkey. Tim with his tea in the rug shop. After the rug “show,” our guide said we only had 45 minutes in the Grand Bazaar. This place is so massive, 45 minutes was like giving someone 2 minutes to see everything in the Mall of America. We just didn’t have enough time; there were no purchases made. To our disappointment, we found out that the Bazaar is closed tomorrow, so we won’t have the opportunity to go back and wander the halls at our own leisure. Our final stop was Rustem Pasa Mosque, a public mosque near the Spice Market. The guide said the purpose was to show us that not all mosques look like the Blue Mosque or Haggia Sophia. This one was much smaller, but still lovely all the same. Once we were back at our hotel, we were damp and tired. With rain still falling outside, it was hard to motivate ourselves to get up and go out again for dinner. We were finally able to get ourselves up and out. Tim picked a restaurant that turned out to be pretty terrific. He said his meal might have been the best one he’s had on the trip so far. I have to admit that the bites I enjoyed had me agreeing. Delicious! Tomorrow is a free day, but we’ll have plenty to do!